When placing your order on our website, shipping and handling is not added at that time if you selected "shipping outside the US" during checkout. Your card will be charged only for the sub-total of your order. Your order will be packed and weighed and then the shipping cost will be calculated by weight and destination. Handling and packaging costs will be charged on a percent order total based on total order size, as outlined further below. 1. You place your order online and the sub-total is charged to your card. 2. Your order is packed and weighed and shipping and handling are calculated. 3. We will send you an invoice through Paypal for shipping, insurance price. 4. Once shipping and handling costs are paid, your order will ship. 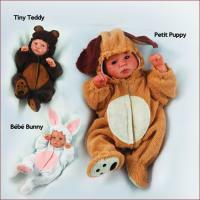 Reborning supplies ,Reborn Doll Kits,Accessories,glue,mohair,rooting needles,hardware supplies and more. 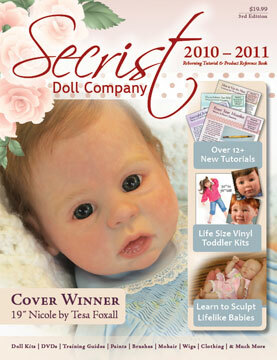 Sculpting forms, clay shaper tools, training DVDs and more for beginner to professional sculptors. 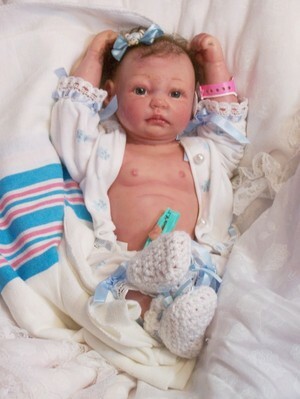 Adorable�expressions�for reborning in sizes 6" to 22" in extra-soft translucent vinyl, along with limb sets and body slips. These are babies who have found new homes. We gave them a home so you can view our artists work. Please enjoy the photos. Many little girls want their own babies to mother. We have painted and assembled these dolls for you. We know how important it is for our young children to play with dolls. This makes them better parents. We are offering these dolls to you now. New Kits, Products, Classes and More! Join our e-newsletter. We NEVER send spam or sell e-mail addresses. Monday through Thursday 9:30AM EST to 9:00 PM EST. You can continue to order any time that is convienent for you. All International buyers will be billed additional shipping for their purchases.